Pat Kelly had been a referee for two years when he discovered just how precarious the occupation could be. 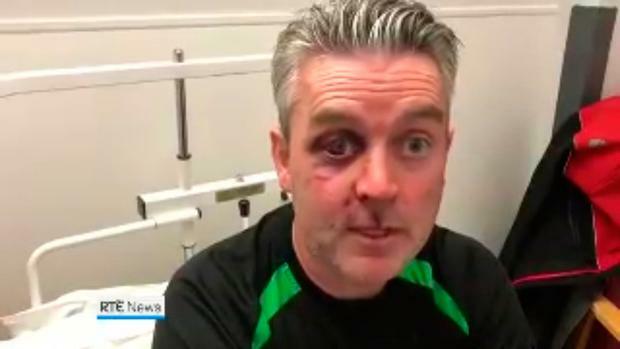 It was a junior soccer game in Cork and a player, unhappy with a decision he had made, chose to let him know in the strongest possible terms: he broke Kelly's nose with a punch. Many thought the 23-year-old man in black would walk away from the game he loved, but he didn't. He pressed charges against his assailant and as soon as the bruises had faded a little he was back, whistle around his neck, and running up and down pitches for 90 minutes keeping game after game under control. That was 1972 and Kelly went on to become one of the most respected referees this country has ever produced. Not only did he spend years refereeing in the League of Ireland, he's also done international matches and Champions League games and now, at the age of 69, works throughout Europe as a referee assessor for Uefa. He will have to retire on turning 70 and he says he will miss the refereeing business very badly. When news broke of the assault on soccer referee Daniel Sweeney at the weekend, Kelly was saddened but not shocked. "Unfortunately, there is a possibility that you can get assaulted in the course of your job. It should never happen but on very rare occasions it does, and you would hope that all the publicity about it wouldn't put people off becoming referees. If you don't have referees, you simply can't have games. They're fundamental to it." Mr Sweeney was refereeing a match in Offaly between Horseleap United and visitors Mullingar Town and he was attacked in the car park afterwards. He sustained a fractured jaw and eye socket and multiple cuts and bruises. Gardaí are confident about the identity of the three assailants, men aged in their 20s and 30s and all associated with Mullingar Town. A day later, as Mr Sweeney recovered in hospital, the referee said he forgave those who assaulted him but asked that in future referees be able to "go on a football field and feel safe and be safe". "It's the least that a referee should ask for," Kelly says, "but you see that they are put in danger on occasion, and not just in this code [soccer]. "And while physical attacks may, thankfully, be very rare, it's not uncommon at all to get verbally abused from both spectators and players - and that's a situation that seems to be getting worse all the time." A referee, who officiates in the highly competitive Leinster Senior Football League in Dublin, says the behaviour of spectators can be difficult to take. "I've no problem with a bit of banter, the 'Ah ref, get your eyes checked' sort of thing. But when they make personal comments about you or use really abusive language, you ask yourself why you are doing it. It's not like we're paid very much to do this." The 1,400 or so referees registered with the FAI earn as little as €46 a match for senior male games, based on a match fee of €28 and an "urban travel allowance" of €18. "You certainly don't do it for the money," the referee says. "It's hard to describe the kick you get out of it, especially when there's a high profile assault and people say to you, 'Why would you put yourself in that position? ', but the simple answer is that it's a way of being immersed in a game you love. It's also a great way to keep fit. I'm in my 40s now and there's no way I would have maintained this level of fitness if it wasn't for refereeing." It's a sentiment echoed by Pat Kelly, who retired from day-to-day refereeing after officiating at the FAI Cup Final in 1996. "You're an intrinsic part of the game and you've got to be focused all the time. You have to keep your fitness up - that can't slip. You'd hear about it from the crowd then." Refereeing runs in the family. His father, Tim Kelly, officiated for years in the League of Ireland and his sons, Alan and Graham, both have distinguished refereeing careers. Graham is one of the best-known referees in the Airtricty League at present while Alan is based in the US, where he referees in the MLS (Major Soccer League - essentially, the American answer to the Premier League). While much of the focus this week has been violence towards soccer referees, their GAA counterparts have had their own misfortunes of late. One of the most talked-about incidents in what has been an incident-packed and contentious Gaelic football club championship season, was the physical attack on referee Damian Harkin during a senior match in Derry. The match, in which Ballinascreen beat rivals Greenlough, had come to an end and Harkin was surrounded by players and supporters. Footage uploaded to YouTube shows a spectator running onto the pitch and striking the referee, who immediately fell to the ground. Veteran Tipperary referee Willie Barrett experienced a similarly distressing incident in the course of his long career. In 2010, while officiating at a South Tipperary club hurling match, Barrett was struck by a hurley wielded by a spectator who had encroached onto the pitch. He says he does not wish to speak about that incident specifically, but said it gave him pause for thought. "You just don't expect it to happen to you and you hope that common sense will prevail and no matter how angry people will be, they will be able to conduct themselves." Barrett, who refereed the All-Ireland Senior Hurling finals of 1994 and 2000, believes referees have it far tougher today then they did when he first donned the black uniform in 1977. "Society has changed an awful lot," he says. "There seems to be a lot of anger out there and people don't think before they speak. You hear all sorts of things said to you in the course of your refereeing life, but you try to put it out of your mind. I've never really understood what people hope to gain by getting so angry about something. "One of the big changes over the years has been the need to blame the referee if your team loses. Other factors aren't considered, but the referee gets criticised time and again. "Every referee I've ever known wanted to do the job as well as they could and to be as fair and true to the rules of the game as possible but, too often, the spectator doesn't see that." Pat Kelly, meanwhile, believes the job of the referee has been made a lot tougher by the antics that players see in high-profile professional football matches. "This idea of everyone crowding around the refereeing, getting into his face, that sort of stuff filters right down to schoolboy level. "If they see it tolerated at the very top of the game, they feel they can do the same. "Once it becomes culturally accepted in a particular sport to not respect the referee, it's very hard to change it," he says. "I've always been very envious of rugby referees. They are able to do the job and their decision is respected. "Nobody is screaming at them from the sidelines and they don't have to worry about somebody punching them on the pitch. "Why can't all sports treat their referees that way?" Rachel Farrell TWO men have been arrested on suspicion of drug trafficking after drugs with a street value of €715,000 were seized by gardai in west Dublin.